Real Estate SEO isn’t magic, but thankfully it’s not rocket science either, its a simple business plan with a simple purpose. Thankfully, human sacrifice is not yet a requirement to improve your search engine ranking. Although, if Google ever changes its criteria it is best to think about who is on the bottom of the totem pole. Refreshingly, SEO strategy starts with a very easy and basic concept, keywords. You begin with a little brainstorming. If you work alone, you may want to enlist the aid of a friend or friends. They don’t have to be Realtors, just people who have had experience buying a home and are internet savvy. Your “Brainstorming Meeting” has one purpose: Gather ideas to create content and research keywords. To get started you will need the following tools: A. your brain and that of your team or friends that you enlist; B. Google Keyword Tool (which implies that you need a computer/s); C.Blogging ideas for 3 months. Regarding Tool C. Blogging Ideas, it is important to remember that this can be almost anything. It could be questions that people commonly ask you when they are looking for a home, questions that sellers commonly ask, new developments in Real Estate policy in your area, etc. Just think about content that is relevant to your community of buyers and sellers. Idea Gathering (20 minutes) – You may order the material however you wish. One suggestion may be to order the ideas according to relevance to your community. Since you are building a 3 month plan, and you want to produce at least 1 good post each week (you could post more often if you can schedule the time, however, it is best to make your initial goals realistic and reachable. You can track results easier and gauge your success in visible increments that will help you stay positive) you will need about 12 good ideas. If you have more, great! Keep them coming, because this is just a plan to get you started, you will need those ideas later. There are many people who have written a great deal about Best SEO Practices, but in my opinion the one person who has nailed down the basic ideas best is Stephen Graham. He is a professional blog trainer and writer and he has written a simple, easy to follow list of things you need to consider each time you blog. 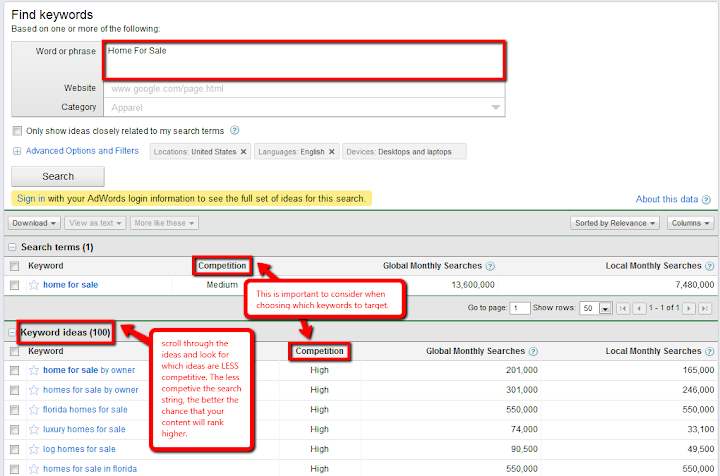 The article is called: 4 Steps to Follow for Easy SEOand I highly recommend that you read it before you begin writing. You will notice a very basic principle that guides the logic of what he has written, it is one of the greatest principles by which we can live: Keep It Simple Stupid. I am not calling “you” stupid (it’s more something we need to say to ourselves, but take it easy, I don’t want to you to damage your self esteem), but it is a phrase that we all need to remember when writing. When your content is simple, the search engines will love it and so will your readers. It’s a win-win formula. The easiest part is behind you, now comes the hard part… be consistent. 20th century British author Aldous Huxley once wrote: “Consistency is contrary to nature, contrary to life. The only completely consistent people are dead.” He comments on a harsh, but very true reality, that it is difficult for any of us to be consistent. That said, what you are striving for is clearly not perfection (unless the idea of an early grave is attractive to you, in which case there is a very different article I recommend reading…). Just do your best to stay organized and execute the strategy that you have now created. No, it won’t be easy. It may require the help of someone else to remind you. Be it by means of your smart phone, your spouse or a co-worker set up daily and weekly reminders to stay on track with your schedule. Do research online and locally before you write to make sure that the information that you are presenting is still up-to-date. One way to stay current and competitive is to invest your time in ongoing education and training. The more knowledge you possess of your industry and it needs, the natural byproduct you will produce is relevant and intelligent content that is usable and valuable to your readers. If you are interested in what programs might be useful, please feel free to contact me. I could give you a list, but honestly then you would know everything I know. How embarrassing that would be… to have all of the knowledge I possess summed up in just 2 blog articles! No thanks, I will save something for future conversation. May you have success with all your SEO endeavors! If you have any questions or comments my preferred contact information is listed below.